Published: Aug. 22, 2013 at 10:11 a.m. Updated: Aug. 22, 2013 at 06:33 p.m. The Oakland Raiders don't go out of their way to remind fans of the JaMarcus Russell era, but that was unavoidable Wednesday. 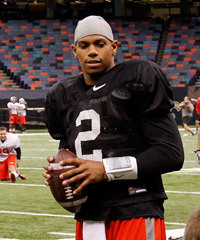 Quarterback Terrelle Pryor waltzed onto the practice field wearing the same No. 2 jersey that Russell donned during his ghastly three-year stint with the team, according to CSN Bay Area. "I had to do a double take," said passer Matt Flynn, who played with Russell at LSU. "Not only was it a new number, the jersey looked a little big on him." Pryor, previously No. 6, wasn't intentionally trying to stir the pot with Raiders fans. He wore No. 2 at Ohio State and asked for the jersey as a rookie in 2011. Hue Jackson, Oakland's coach at the time, rapidly put the kibosh on the request. "Coach won't let me wear No. 2. Why? I don't know," Pryor said at the time. "You tell me." Tell him, Raiders fans. Tell him.